Vegan. Vegetarian. Halal. Kosher. Gluten Free.This is the genuine article. Tabasco® Original Red Pepper sauce is made from special peppers which ripen on the bush. Tabasco® Original Red Pepper sauce is made by aging special peppers in wood oak barrels. Years of curing time ferment the peppers and add a smoothness to the natural, robust flavour of the pepper. After ageing, the cured pepper mash is mixed with pure, strong vinegar, the seeds and skins are removed and the sauce is ready. Versatile? 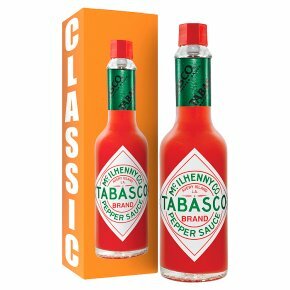 Tabasco® Original Red Pepper Sauce can be used to add flavour, or heat, to liven up any dish. You can easily taste the difference between Tabasco sauce and ordinary hot sauce. By Appointment to Her Majesty Queen Elizabeth II Supplier of Tabasco® Sauce McIlhenny Company USA. Serving Suggestions Splash on pizza to add some spice! Bring out the best in breakfast, wake up eggs with a peppery punch. Shake on your burger to bring the flavours to life.